Persons already registered with the Health and Social ministry who want to serve their customers more comprehensively and effectively should contact me. I think it is time to educate younger colleagues so that my skills can be passed on. If you want to work effectively and globally we can plan a two-week intensive course for you. The crash course gives you the ability to provide better treatment results than before. The basic problems of our health care system are the lack of co-operation between the different health care sectors, unnecessary and untimely surgical operations (especially for the treatment of back, elbow and wrist problems), and above all, excessive use of pharmaceuticals. Long-term use of drugs inevitably destroys the digestive system. At first, the stomach mucosa is destroyed, then the small intestine, and eventually, the liver and the kidneys. Of course, we also need pharmaceuticals, but common sense should be applied. There is no sense trying to numb symptoms using pain killers and antidepressants, and leave the basic cause underlying the symptoms undetermined and untreated. Novel diagnostic methods are being constantly developed, but the basic cause of many health problems remains the same, although the symptoms have been given different names. Often, we should simply determine, which nerve tracks and muscles are involved in the creation mechanism of the symptoms. See elbow and wrist problems. Whatever the diagnosis, it is worthwhile to determine what can be done using a safe manual therapy, before resorting to more radical treatments, or heavy use of multiple drugs. What led you to this profession? It started when I had my own ailments that I could not find help for. The idea probably came from my childhood when my grandmother massaged clients at home and the whole house smelt of camphor oil – it is one of the strongest memories from my childhood up to my early teen years. My mother’s mother’s father, Abraham Mikkonen (1845-1918) was a very talented doctor of natural medicine and very skilful at combining medicines with natural remedies and herbs. Her daughter, my mother’s mother’s sister, Anni Pölönen (1889-1960,) was a so-called “miracle worker” who knew how to cure almost anything. She served as an assistant to her father from the age of 15 and continued alone after his death. Some patients travelled long distances to get treatment. Many people thought she was the best in Finland. Doctors came to her to get help for themselves and for their patients. For example, the Chief Medical Officer of Turku Central Hospital’s Dermatological Department wanted to hire her as an adviser in 1955. The Chief Medical Officer was willing to pay his whole month’s salary in order to get her to Turku. Anni was not interested in the proposal but continued to work at home in North Karelia. So it runs in the family? Yes, you could say that. The desire to help people has been in our family from generation to generation. Apparently, I inherited the desire and passion to help heal people too. I became interested in massage in the late ’70s, when I started to train hard and got careless which gave me a variety of injuries. I could not find anyone who could have helped me, so I tried to help myself and my friends at the same time. Over time I learned a lot about my body, but I realised that to be able to do this work legally I needed some education. I took a basic course at Axelssons Gymnastiska Institut and then further courses at the Back Research Foundation. 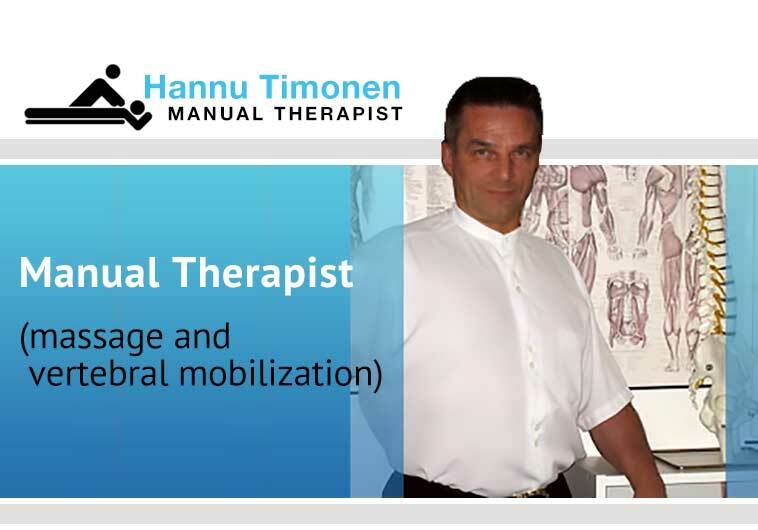 I have been registered with the Central Register for Health Care Specialists (Terhikki rekisteri) in Finland as a fully trained masseur with a protected professional title since 09.02.1984. Registration number 50600873041. What is so unique about your massage? Over many years I have developed a technique of combining massage with treatment of mobilisation of the vertebra and how deep to go into the muscled during the massage. I have now worked as a professional for 30 years and have tried to constantly improve my technique in collaboration with my patients. How does mobilisation of the vertebra work and why in combination with massage? Mobilisation of the vertebra releases the locked vertebrae and returns them to their normal movement. This will allow for smooth functioning of the nerve impulses. In order for mobilisation of the vertebra to be effective you must first ease muscle tension with massage. Massage combined with mobilisation of the vertebra is extremely important. If treatment of vertebra is performed without massage the tightened muscles surrounding the vertebrae become locked again. Chiropractic manipulation is therefore not always as effective as people think. I’ve heard many people say that the treatment is painful. Tense muscles are painful to treat. The more the treatment hurts, the greater is the need for treatment. If the muscles are in good condition you could fall asleep during the treatment, but then there would be no need to come for therapy. Apparently everyone has needed the treatment since no one has fallen asleep on my desk. When the lactic acids have been removed from the muscles the blood circulation and metabolism in all the tissues start to function, the treatment is no longer painful. Why do we need multiple treatments? Patients frequently come to me over a long period due to long standing problems. Muscle tension has intensified in the body for many years and therefore the recovery is not successful in just one session. Sure, healing often begins on the first treatment, but treatment is usually required 4-5 times. It is desirable to have a few days of recovery between each session in order to achieve optimum results. It takes time to remove the lactic acid from the muscles. Besides, the tissues and the brain must adapt to a new situation. Locked vertebrae in the back are released and the neural networks that control almost all the activities in the body are freed. These processes require a little time. This job requires a good physique in order to massage sufficiently deeply and with the right touch. The orthopaedic surgeon Antti Heikkilä agrees that the root cause of many symptoms is the inadequate maintenance of the muscle and even the deep involuntary multifidus muscles treated. For this treatment to succeed utmost strong physical strength, strong thumbs, and time are required. One cannot fail to notice your good physique. Tell us a little about it. I have played sports to some extent my whole life, but I started weight training in 1974 when I joined a power training club. Since then I’ve been training on gym equipment up to about five times a week. The strength in my arms and hands are prerequisites to ensure my treatment works. Tell me more about your treatment. As I said my strength and durability ensure that even if I have many patients a day I can guarantee they all receive the same effective treatment and I do not get tried myself. The treatment suits all. My youngest patient has been four years old and the oldest was 94. Both men and women come to me, but mostly women. Why are there more women seeking help? It seems women have a better understanding of the need for treatment than men and are more willing to seek help. For example, fibromyalgia, which has become known as one of the so-called “women’s diseases”, is one of the diseases I can treat. Half of my patients come to me with a diagnosis of fibromyalgia, and most of them are women. Women very often have tension in their shoulders and neck due to “carrying the weight of the world on their shoulders.” Not only have they the stress of their job but they also have another shift waiting at home. No wonder they become tense and ill. Furthermore, we all have our own problems, which can cause tension in the muscles. Also, draughty and cold working environments, monotonous jobs and bad postures aggravate the matter. Draught is the worst of all external factors. Where do patients come from for treatment? Over the years, my patients have become quite global. For example, they have come from Australia, China, Thailand, Barbados, Canada, the USA, Russia and many European countries. These days up to half of the clients are from overseas, mostly Sweden. I have estimated that I have been able to help more than 6,000 people over the decades. What would you say to those who would like to come to you but are hesitant? Health is a priceless treasure. I can guarantee that you will be cured or at least much better after several sessions. There is light at the end of the tunnel of pain and exit to a full life, and so many of my patients have reached it. My website has some patient testimonies and stories and although they are just tip of the iceberg, they show the effectiveness of my treatment. My goal is to help people. That is my motivation and joy in life. I know I can help you!